there is a solution — trap live pigeons for dog training. Pigeons, or rock doves, are native to Europe and were brought here by settlers in the 1600s. They were domesticated birds that served as pets, food and occasionally for their homing skills as message carriers and racing birds. They are found across North America and have adapted to a wide variety of environments, from rural farm lots to city parks. Since they are not native, pigeon trapping usually does not require any special permits or licenses from state agencies. However, it is always good to check with local authorities in case there are any special rules or local permits for nuisance trapping in your area. 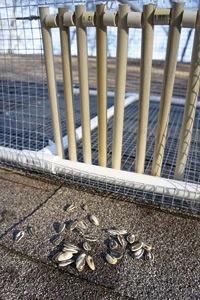 Pigeon traps vary in size and material, but most feature a one-way entrance that prevents the bird from exiting the trap. 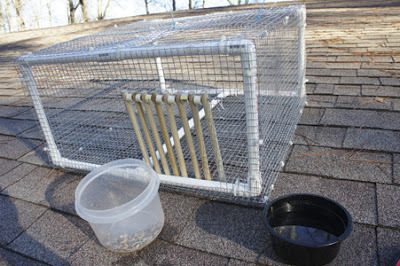 Use an open mesh to allow other pigeons to see the bait and other birds inside trap. Pigeons are social birds and will fill a trap quickly if they see others feeding inside. 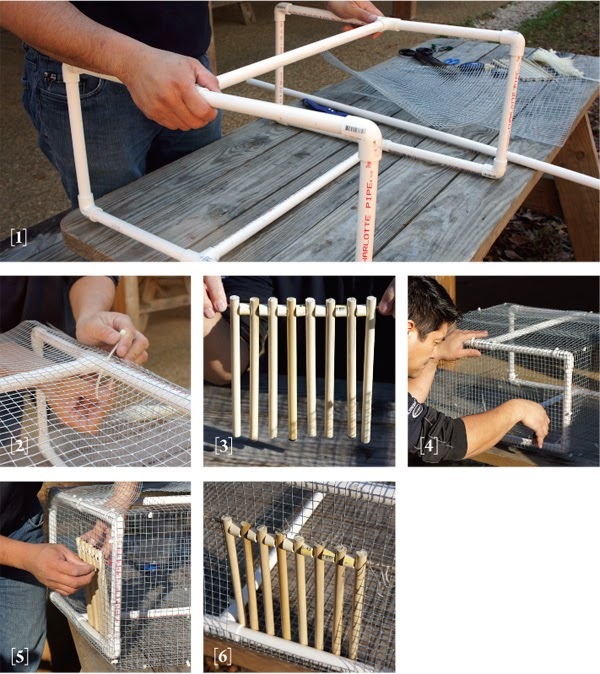 Build the cage frame with PVC piping, with rough dimensions about the size of a medium-sized suitcase (24"x12"x12"). If cage wire is stiff enough (10- to 14-gauge wire), you may omit the PVC frame. Secure wire panels to PVC frame using wire or zip ties. Create a one-way door using arrow shafts or dowels and metal rod/bamboo skewer for the hinge and 3⁄8-inch PVC spacers. Make a one-way entrance on PVC side of trap (8"x8"). Create an access panel on top of cage, near the one-way door. Install one-way door on entrance, using wire or zip ties. Place the trap where pigeons congregate, such as feeding spots. On roofs, leave the trap near roosting sites or watering areas (around air conditioners). Spread feed around trap entrances and inside floor of the trap. Leave a water bowl inside cage and check the trap every 24 to 48 hours. Wow SALEEM MUZAMMIL. After serving, as you state, carrying messages. Especially in times of war. Resulting in saving many lives. Feeding the starving through the centuries. They're to be used as live bait? Please explain to me what exactly happens to a pigeon used as 'live bait' both physically & mentally. Pigeons are a Fu$%ing pest - rats with wings that sh!t everywhere and spread disease. Kill them all! I have a back patio where my wife and I used to sit on summer evenings and where our grandkids played. Then our neighbors started feeding pigeons. Now the chairs and table are covered with pigeon crap and the stench is nauseating. Pigeons are filthy vermin and are not native to North America. They don't belong here and should be eradicated. Now someone will say people of European descent are also not native to North America, to which I would say, "So what? I don't crap all over other people's property!" Thanks for the trap idea. I'm going to build one, trap as many of these vile creatures as I can, kill them with my bare hands and dispose of their miserable carcasses in the garbage. Sounds pretty hateful, huh? I guess, but I'm kind to human beings. People are valuable and I would never refer to a person as "despicable" for wanting to rid their environment of a health hazard. What a despicable human being. Pigeons are beautiful intelligent animals who helped us win the second world war. Can this author be reported for animal cruelty? How low can you go using pigeons for live bait? Grow up then SHUT UP! Im a vegetarian and if need be, I will trap and eat a pigeon to feed my family. Sorry! thats cruel life. Hard times will come as they have. Thanks for your help! Hopefully I'll have my dogs on some pigeons in no time! There are a few pigeons in my neighbourhood which have plastic twine wrapped round their feet, I hope this trap will help me to catch them so I can free them and hopefully save their feet, thank you. I'm so happy to have found this post. I am not a fan of this particular bird and I'm happy to find a humane way to get rid if them before one if my large dogs were to eliminate them for me in a very inhumane way. they're not human or humane! They just are going to do what you allow them to do... and what needs to be done! I had a dog who... who saw it fit to "harvest" any furry mammal that entered my yard.... except another dog. And I was OK with his decision... because he wasn't fast enough or big enough to catch a deer! That is a clever light-weight design. Kudos. ill be trapping pigeons and training dogs in no time. Clever design, but why use them as bait? Just eat the pigeons, they're delicious.